So for some reason I thought it would be a good idea to try and ride Matt's bike. It was a mistake right from the start. I tipped it just trying to get it out of the parking lot. Matt had to help me get it back up because it's so dang heavy. I should have stopped then but of course I didn't. I rode for about a half and hour and I was doing pretty well until I hit a bump and I lost control. I bailed off of the bike before it tipped all the way and ended up on the ground but not before the handle bars clipped my arm and bruised my ribs. Luckily the bike went under the parked car and not into it. I felt pretty stupid to say the least and have been so sore ever since. I was wearing a helmet of course but I must say I have had a pretty bad headache ever since. I have decided that I am definately a car person, not a bike person. 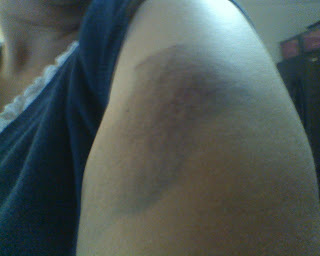 Here is a picture of my prettiest bruise. Oh ouch! I am glad you are ok. How did the bike fair? Oh man! I'm so sorry that happened! Carter is sitting right next to me and is saying "oh no, Aubrey has owie". Too cute! Hope you feel better soon!